ATV Review Directory - 4 Wheeler Reviews, Comparisons and Tests. The ATV Review Directory lists our best ATV comparisons, reviews, recommendations, and tests. A load of research is done before we compare ATVs. Rider surveys, test results by other media, talking with dealers and owners, and of course checking the machines out for ourselves. I can tell you we value the rider and owner feedback above all else. Remember that a lot of reviews you read are only that guy's opinion of that test unit on that day in that particular situation. So if that guy is a 6'2", 220 pound expert rider on a factory prepped ATV in the Southern California desert - his opinion may not mean squat to you if you're a small novice rider on a tight, muddy trail in Arkansas. My point is to take all this review and test stuff with a grain of salt. Worry about what you need an ATV to do. Not what some paid test rider for a glitzy magazine says. You can usually guess what they're going to say based on who advertises the most in that magazine. Which ATV is Best? Find Out Here. UTV / ATV Rentals - Top Tips - Covers everything you need to know about renting a UTV or ATV. Why it may make more sense to rent than buy, what you can expect to pay, and what options you may need. Electric ATV / UTV Buyer's Guide - Learn all about the top electric ATV and UTV models available today. Reviews and comparisons of models from three major manufacturers. Top ATV Camping Tips - Our top tips to get the most from your ATV/UTV camping trips. Advice on how to get started, what you'll need and how to carry it all. Everything you need to know to keep your camping both fun and safe. One of the most competitive classes in the ATV world is the mid-size utility ATV. Naturally, we felt the need to do a full blown comparison test. You don't want to miss our most popular ATV review. ATV Comparison - Budget 4x4 Four Wheelers Reviewed. What's the best 4x4 ATV under 6 grand? Check out our exclusive comparison test of under 500cc, under $6,000, four wheel drive utility ATVs. Find out which ATVs stood up the best to this 24 hour torture test! Grind out 24 hours of trail riding with us to find out which of our test ATVs were the toughest. Compare ATVs - Best 450 class Sport ATVs. Don't miss our 450 class sport ATV comparison! Find out how our seven contenders stacked up. One exciting fact is that they were all good, some were just a little better than others in certain areas. We'll give you the pros and cons of each model, along with recommendations for the best fit for your kind of riding. Top Ten Best ATV Values. 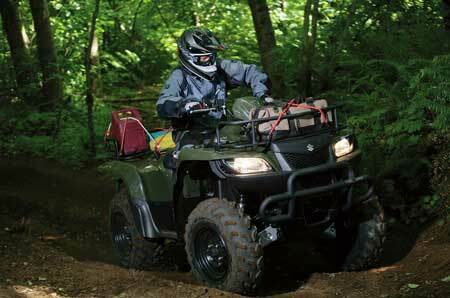 The utility/recreation class of ATVs offers the best bang for the buck in our opinion. But which models are the best value within that group? Come find out with this exclusive comparison review. Best value for the price was the driving force in this ATV review, regardless of size or engine displacement. Our conclusion may surprise you, but check it out and see if you agree with our opinion.